Do you think Kali and I were that happy at home? This year was disappointing. Once again, no Scotties. Usually there are 3 Westies but none this year. Terriers in general were scarce-there was a Border Terrier. For some followers there were no Weimaraners, Dobermans, or any other breed that I know some of you have. There was a Shih Tzu. You’d think out of the 538 dogs, at lease ONE would bark with a burr. The opposition this year was the New York Mutts. Most of you have seen this one before, but some haven’t. 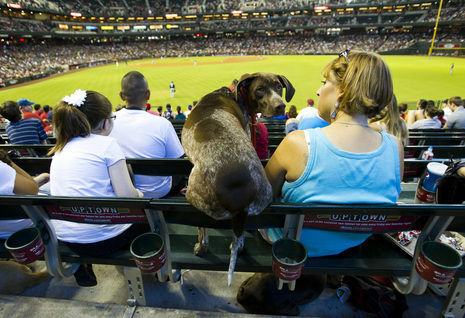 It was taken a few years ago by Michael Chow (good name for bark in the park), a photographer for the Arizona Republic newspaper and a friend. No picture of the event has topped it since. 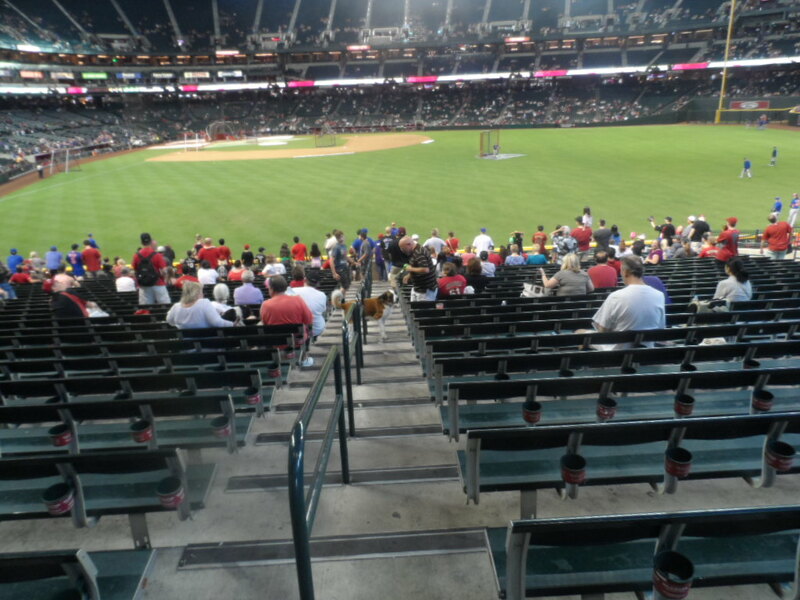 WE think they need MORE Seats so YOU can go… This is discrimination, if you ask US. Kali and I take it very personally. I knew a border collie that would sit like that. All the time. I sure miss him. Kaci and I would do that (for treats, of course). Pretty sorry situation that you had to stay home. Mama wouldn’t be taking me either…too many dogs to navigate for her. However, if you love it, he should have taken you. What’s with Ms Egglayer? Hope she is through with production . Hi Kismet! We have been thinking about you. What the woof, SOLD OUT! I think he is just telling y’all that, it seems if he works there he’d could be the first to purchase two tickets….just sayin’. In His defense, those dogs don’t really want Him to lose his job and then not have any green beans. They’re not thinking clearly. Awesome shots! These are some of my favorite events out there. 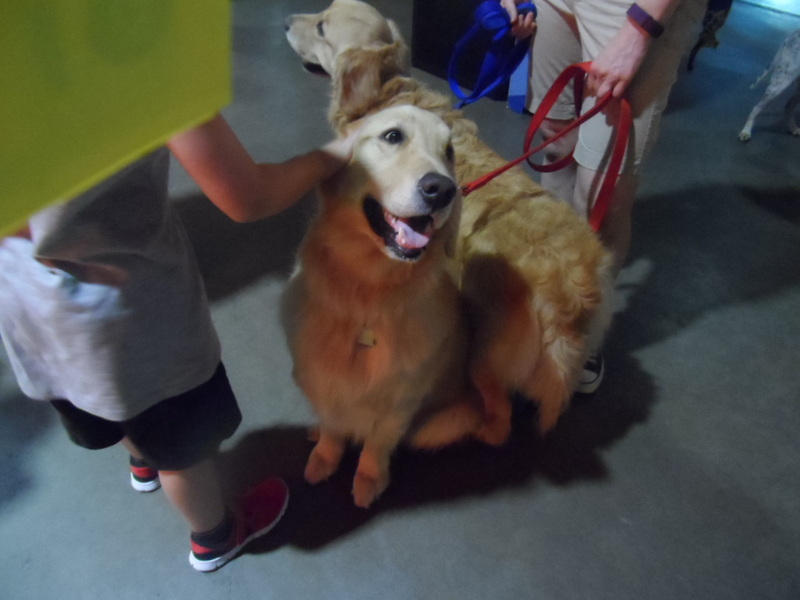 The crowd gets more excited about the dogs than the players. He does. 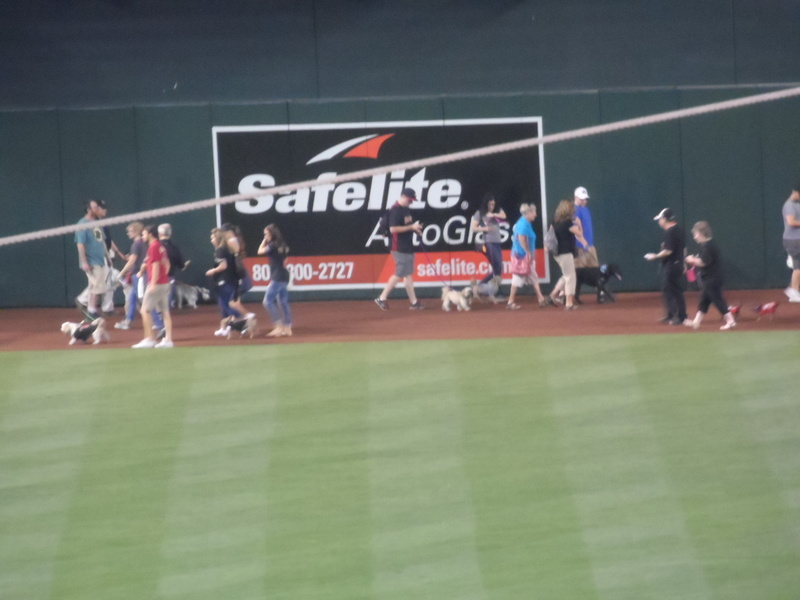 Home run hitters are common but a good dog lasts in your memory forever. 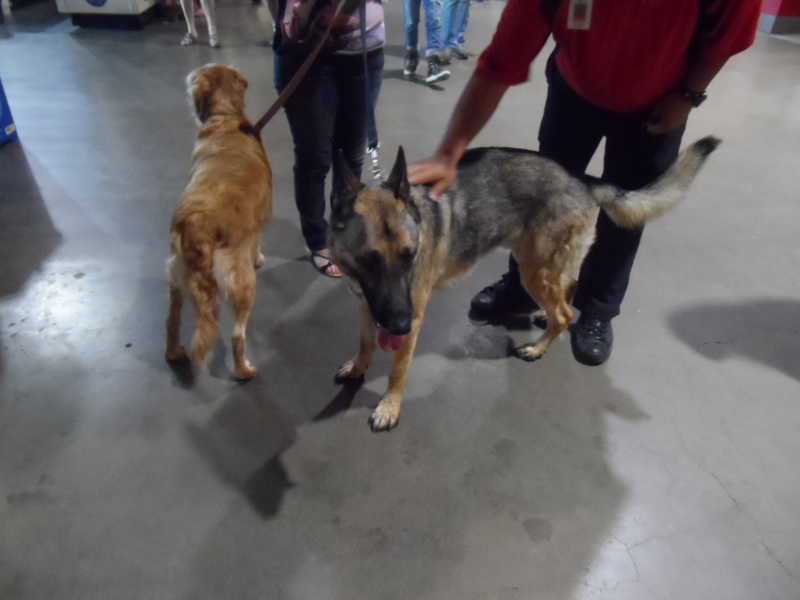 Wow, I know the NY Mutts stink but what a bummer that you couldn’t get to go! Was it at the BOB? Yes and no. BOB stood for Bank One Ballpark (at least it wasn’t Enron Field).The firrm that put in the grass surface started advertising “BOB sod”. Bad move. Bank One got bought out by JP Morgan (Chase Baml which used to be Chase Manhattan). It is now “Chase Field”. The turf guys didn’t like it when I suggested that BOB sod (they still call it that) should be renamed to “Chase Waste”. Stick with me, I’m full of it (good marketing ideas). You should visit this blog http://www.militarywifeandpuglife.com/2015/06/pug-posts-red-sox-pug-fan-baseball-fever.html? 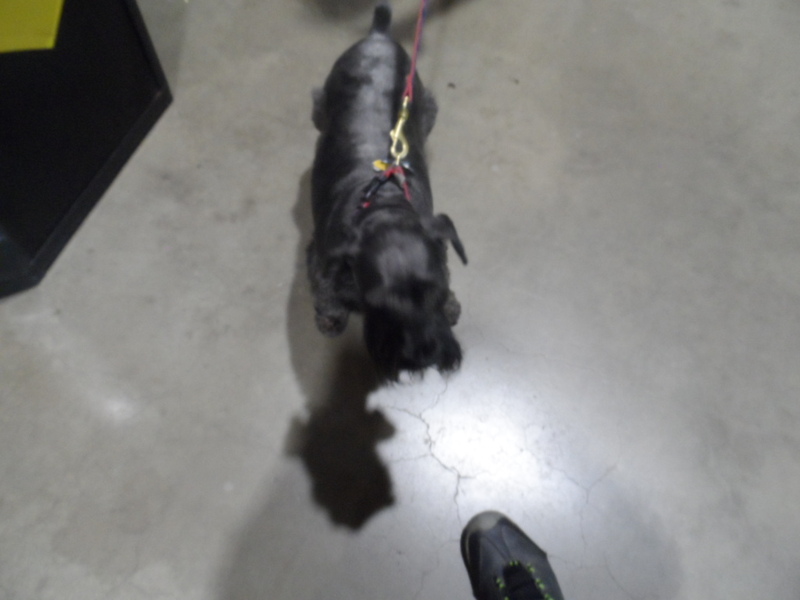 Maddie The Pug got to go to a game and stay at a hotel. Where are the Scottie? Love the picture by M. Chow. We think you may have to go to the Court of Common Fleas……..
We bet he tells everyone at the park that he hasn’t even GOT dogs! There NEEDs to be a terrier contingent in the crowd! NO WAY! He usually wears the company shirt, but sometimes not. 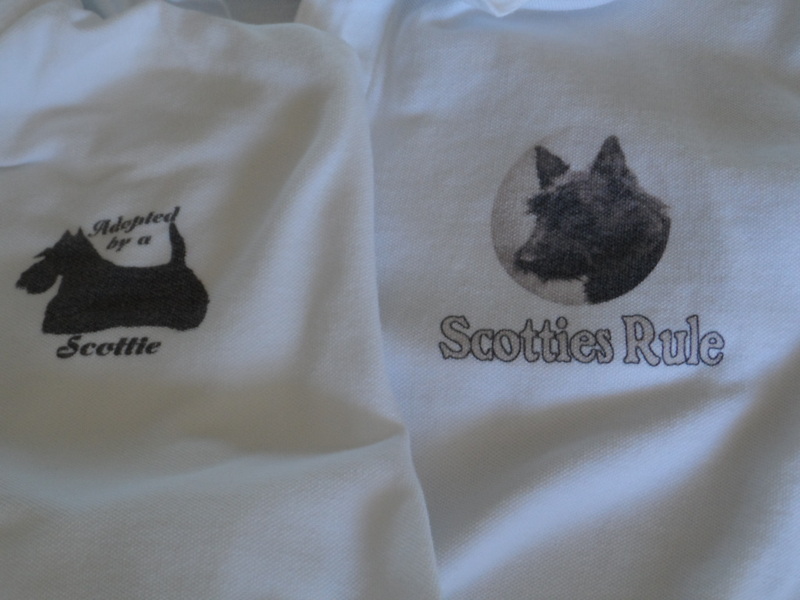 He wore the “Scotties Rule” shirt. Hey…this is like 4 years in a row none of you has got to go…it’s about time for soem real howlin over this! You gotta understand, he could lose that job and we’d be stranded orphans with nothing to eat. We have never gone to the baseball stadium when they have dog days. It is usually too hot and we are not the best behaved dogs. We might cause a riot and mom doesn’t like to be embarrassed. Put a cheeleader skirt on Shelby and you’ll fit right in. Something has to wake up them Marlins. We heard about you from Sweet William the Scot! He sent us over! You gotta understand that the one that wouldn’t take us went to school in New England (Connecticut). He went to Fenway once but didn’t attend a game (you mean they don’t have a game in the middle of January???). They wouldn’t sell him a ticket. Well, let me rephrase that, they were so stupid at Fenway that there was nobody there to sell him a ticket. And there was not much snow that day. C’mon Kaci, just say the truth. He’s blonde. No westies or scotties? What are da point? Well, there have been Westies there in all the previous ones so not having even one was unexpected. Just not fair that you had to stay home. Would you like me to send Kyla over to straighten them up….I mean afterall she is 10 yrs old. That last pic was adorable!! Anyone named Kyla is certainly welcome here. Well, the peep did a good job with the runner up. Oh me. Looks like I’ll have to traipse out there for next year. What! He left you at home AGAIN!! At what point are you two going to put your paws down and demand an honest reason from him? UN.BE.LIEVE.ABLE. We think the winner of the “closest to a scottie” award was worthy. 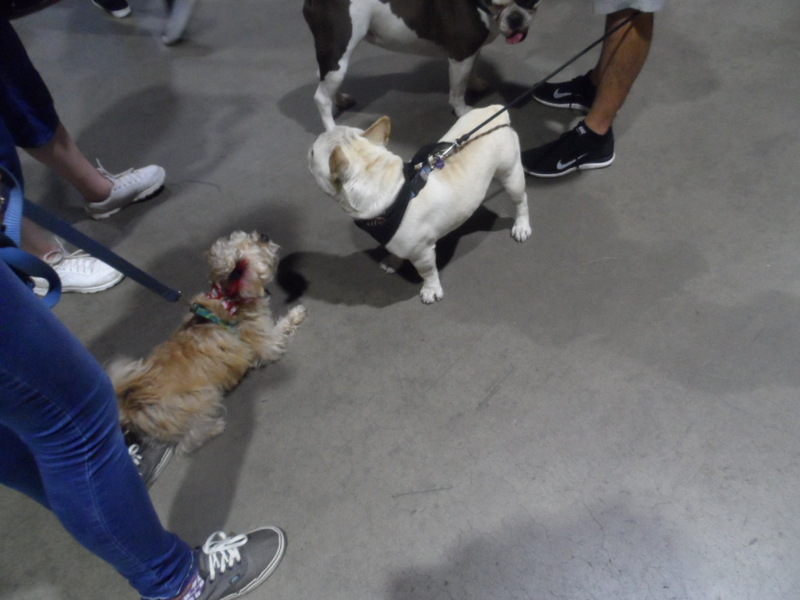 Man… What with all these doggies being left at home… First Bella, Roxy & Dui…. Now you guys…. Not cool.